I have the most uncooperative nails on earth… I’m not sure if it’s my nail beds or the base/top coat I use, but 75% of the time the ENTIRE layer of polish on some nails will peel off in one piece. By no means am I talking about just a chip, I won't even be picking at them, but I will actually paint my nails, shower, dry off, and two finger’s polishes will literally be M.I.A as if I forgot to paint them. Later found on the floor of the shower. So sketchy. Gel manicures are the only thing my nails won’t reject. I could go 3-4 weeks with the same gel mani as long as a good job was done and I’m able to beat the temptation of picking at them. Understandably, gels are definitely not something I can afford to do all the time so I've been taking a break. I was curious about Sally Hansen’s Miracle Gel nail polish. It had to be too good to be true – with only 2 coats of your preferred color, 1 coat of the top coat, and no UV lights, you’re good to go. Lasts up to 14 days. Plus, the polish comes off just like normal nail polish, apparently no soak-off required. LOL HOW? I went to Harmon Discount to check it out and there were over 50 colors to choose from. After staring for 5 minutes I realized they were all sold out of the top coat - go figure. Went to Ulta, top coat sold out as well. Not meant to be maybe? Thursday night I ran to Target to get a few last minute things before I left town for the weekend. It’s obviously impossible to go to Target without checking out the cosmetics department. There were Sally Hansen’s Miracle Gel top coats for days, but the color selection was wiped out. This had to mean it’s worth it. I picked out a neutral called Twiggy and tried it the second I got home (totally ignoring the fact that it was late, I still needed to pack and do a million other things). The directions call for 2 color coats, but since the first coat came out a little streaky, I decided to do 3 and then the top coat. I hate polishes that come out sheer and not solid so I was very happy with this. The polish is thick so you definitely have to work fast, and I was shocked at how fast my nails dried 4 coats later. 4 coats of normal polish and that ish will never dry. P.s. - Twiggy was only a trial run, I had like 3 loads of laundry to do, a shower to take, and 2 bags to pack that night. The following day there was not one sign of smudge even after all of that, and a smooth, solid manicure overall. Mind you, my natural nails are still recovering from real gel manicure removal, so it was nice that Sally Hansen’s Miracle Gel completely covered up all evidence. Here’s my nails at day 5 of Twiggy (don't mind my baby hands and tiny fingernails). So far so good for battling work, tanning, gym weight training, and frolicking around NYC all weekend. 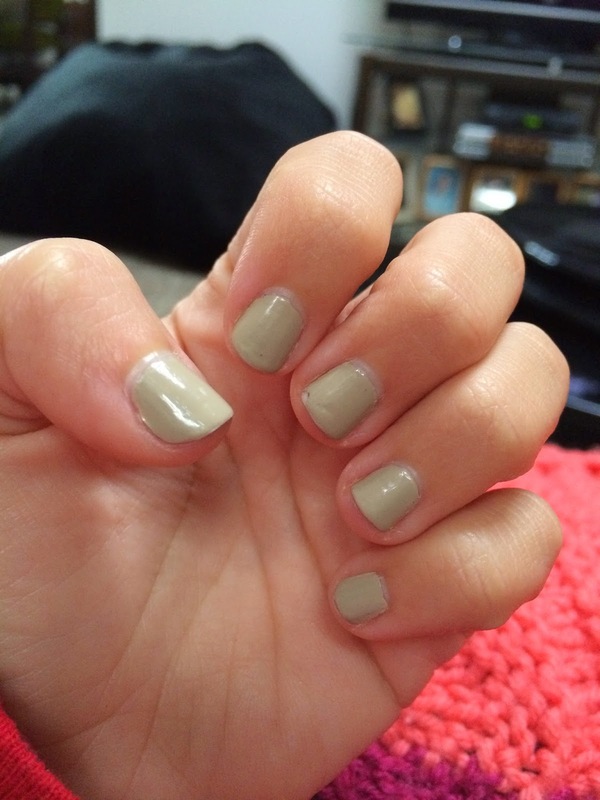 My nails are nowhere near ready for a new paint job and I already have my next Miracle Gel color picked out. Bravo Sally.